What you need to know that isn't common cents. 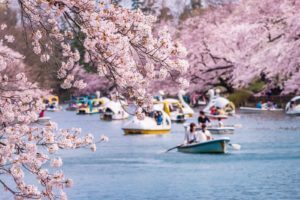 The procedure for opening a new account at a bank in Japan probably isn’t all that different from your home country, with a couple of additional caveats. These days some banks may accept a signature in the absence of a personal seal, but this isn’t guaranteed so it’s best to have your seal prepared just in case. If you’re already working, you’ll probably need to take an hour or two off work to get it done. The time taken to set up and open a new account varies depending on the bank you choose and how busy that particular branch is. Once you enter the branch, you will be given some forms to fill out with personal details, such as name, address, employment situation and so on. Depending on the bank, you may have to fill these out in Japanese so it is advisable to take someone who can speak, read and write Japanese with you if you aren’t confident in doing so yourself. A small deposit, usually a minimum of a few hundred yen, should be submitted along with your forms. You’ll also be asked to create your own 4-digit PIN code, and after a short wait (usually 10 or 15 minutes) you’ll receive your bank book. This is called a 通帳 (tsuucho). The bank book, or passbook, is also an old-school way of tracking the activity on your account. While most people now check this online, you’ll see a lot of the older generation putting their book into the ATM machine and printing out their statement on it. One benefit of the book is that if you lose your card, your bank book also acts as proof that you’re the account holder. Typically, you won’t receive your ATM cash card on the same day. As an additional precaution against fraud, new ATM cards are posted out to your home and usually arrive within 5-10 working days. Your cash card will display your name, the branch code of the bank that you belong to and your account number. On the subject of cards, some banks offer additional benefits such as debit cards or pre-pay credit cards to new account holders. Some banks offer online banking services and customer support in English, others do not. If you move to a new address make sure to update your bank with the details in order to receive mail from them. 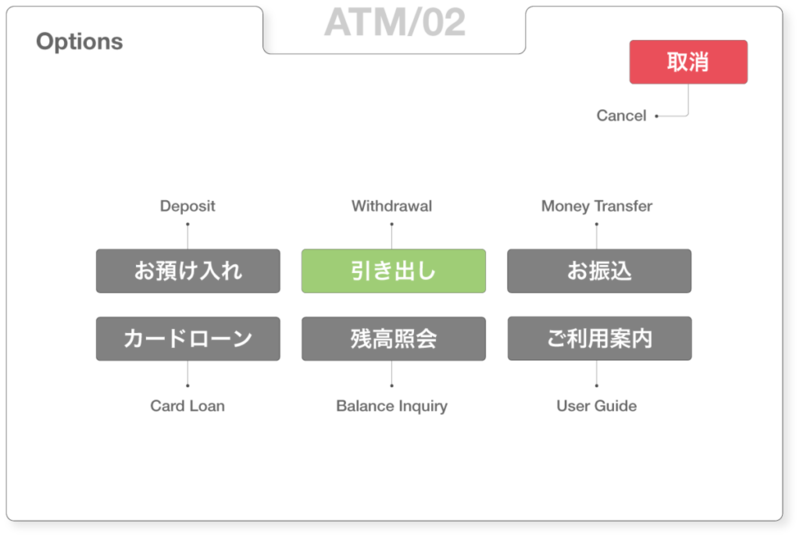 These days, most ATMs in Japan, especially those you see in convenience stores and large shopping centers, have English language options, and in many cases some other languages too. 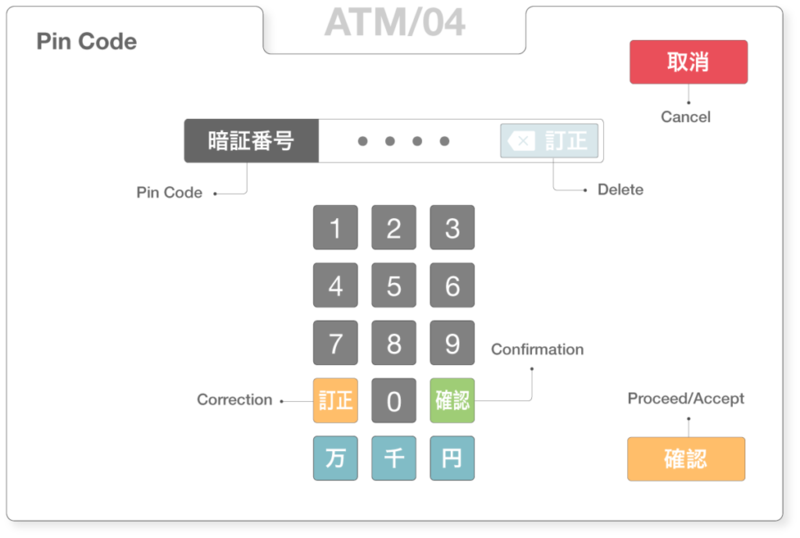 However, there remain a few holdouts, especially amongst the smaller regional banks, where the ATM interface will be exclusively in Japanese. Push this button if you want to withdraw. The next screen will prompt you to enter the amount. The cash window will open up. Insert the cash you wish to deposit (notes only, no coins). Once the money is processed a screen will come up asking to confirm your deposit. 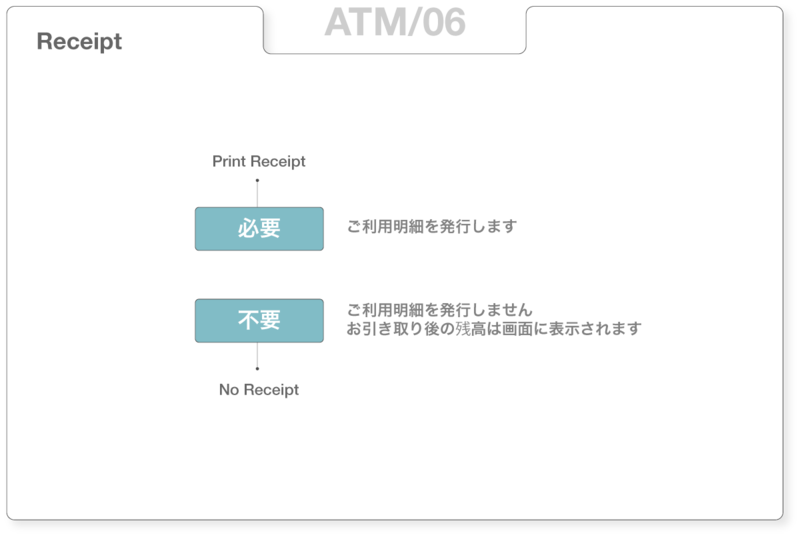 Press はい (yes) to confirm or いいえ (no) to cancel the process and return your cash. Push this button to see your available balance. The nature of how many foreigners in Japan are employed means that often contracts are only for 1 or at most 2 years. This instability will, of course, put off potential lenders. Visa duration is also a factor, most non-permanent residents in Japan are here on a 1 or 3-year visa. Tightening credit regulations mean even something as trivial as not paying your gas bill on time one month can negatively affect your credit rating. That being said, the actual process for applying for a credit card isn’t too dissimilar to the process for opening a bank account. Either go online or go to your bank branch, fill out the requisite forms, provide additional documentation where required and then play the waiting game. It takes some time for banks to carry out all the requisite checks, but usually you’ll get a decision, by post, within 2 weeks. Applying for online credit cards such as those available from the online retailer Rakuten seem to have a higher success rate. The automated process also makes everything run a lot faster, with rejection or acceptance usually coming within a day or so. In Japan, most lenders will not give you any explanation as to why your application was declined. However, there is a vast number of different cards out there for you to apply for, so if one declines you, apply to another. The process does seem to have a certain degree of randomness to it, since different lenders use different criteria to gauge a candidate’s credit risk. It’s best to wait at least 3 months before re-applying to the same institution. 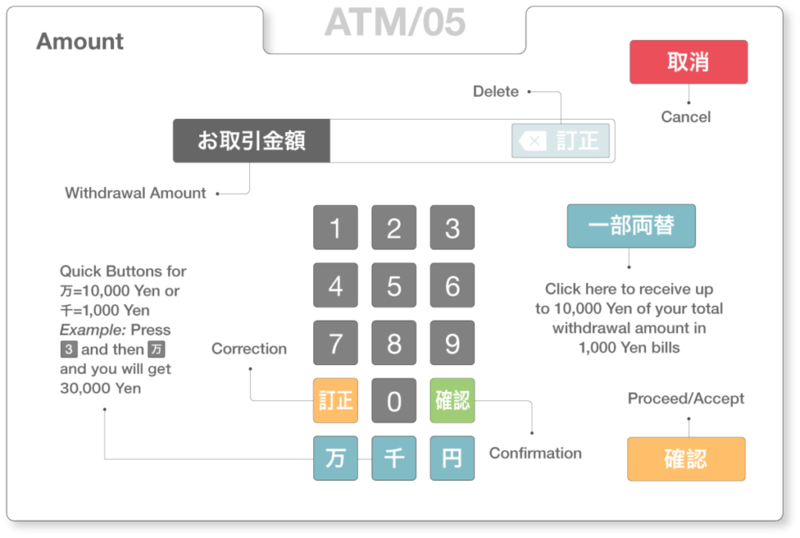 In principle at least, it is possible to send money overseas via a transfer from your Japanese bank account, however, this isn’t really the most practical way to do things. Typically, they will charge you ¥4,000 just to initiate the transfer, and the exchange rate isn’t especially generous either. Depending on how efficient your bank’s systems for international exchange are, it can take anything from 2 days to 2 weeks for the money to hit your overseas account. Although you do not need to have a Shinsei Bank account in order to use this service, you will be required to complete an online application and send in a few document copies, such as proof of address and ID, for verification purposes. Once this is complete, you should receive your welcome pack within 2 weeks. Within the pack is a “b-link number”. Keep this number safe, because you’ll need it when it comes time to make transfers. 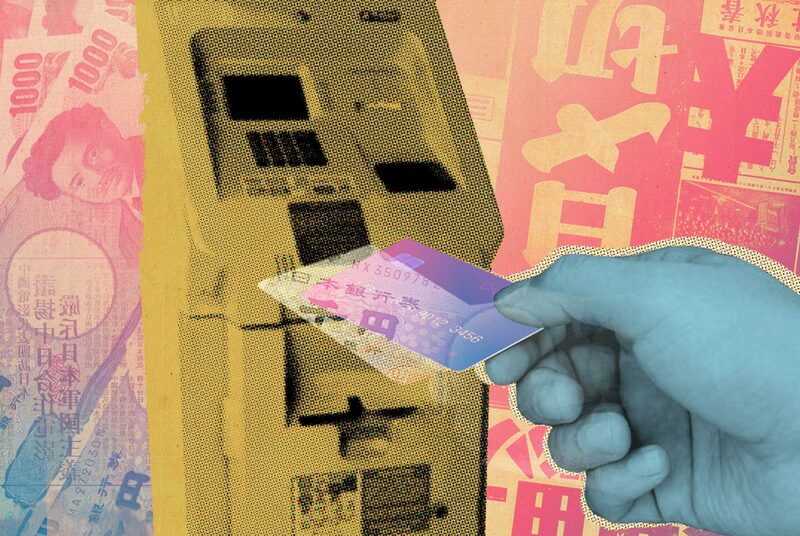 From then on, transfers can be made either at an ATM or in person at your local bank. Basically, you’ll make a transfer into the GoRemit Japanese account which will then be forwarded to your overseas account. If you’re not confident in your Japanese ability then don’t worry. Included in your welcome pack is a bilingual letter you can take to your bank to show the staff what you’re trying to do. Each transfer costs ¥2,000 and should reach the overseas account in 2-3 business days. Depending on how the overseas bank operates, there is the possibility of this being delayed by another day or two. GoRemit is probably most effective for those sending large amounts of money abroad (in excess of ¥100,000). Seven Bank (from 7-11) also offers a money transfer service, in association with Western Union. It is available at selected convenience stores all around Japan. The fee you’ll pay for the transfer increases with the amount, so the more you send, the better value for money. 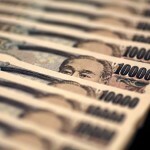 Sending ¥10,000 will cost you ¥990, sending ¥100,000 will cost you ¥2,000. Again though, the exchange rate isn’t the best. You can also find branches of Western Union located next to Travelex currency exchanges in most major cities across Japan. To make the transfer, you will need to bring along your passport and ID card, as well as your My Number card. TransferWise is another option. They have the lowest fees for sending money, however, they also charge an additional percentage commission based on the overall amount transferred (typically around 0.5%). Where TransferWise does come out in front, however, is in their exchange rates, which are almost identical to those found on the various real-time currency converter apps. Setting up an account at TransferWise is all done online. You’ll need to upload a copy of your residence card (front and back) and My Number card (or juminhyo with the number on it if you don’t have a card) to your TransferWise account. They’ll then send you a letter to verify your address with an activation code that you just have to enter. Once you’ve set up your account, transactions can be completed via their extremely user-friendly website in English —the whole process is trackable too. 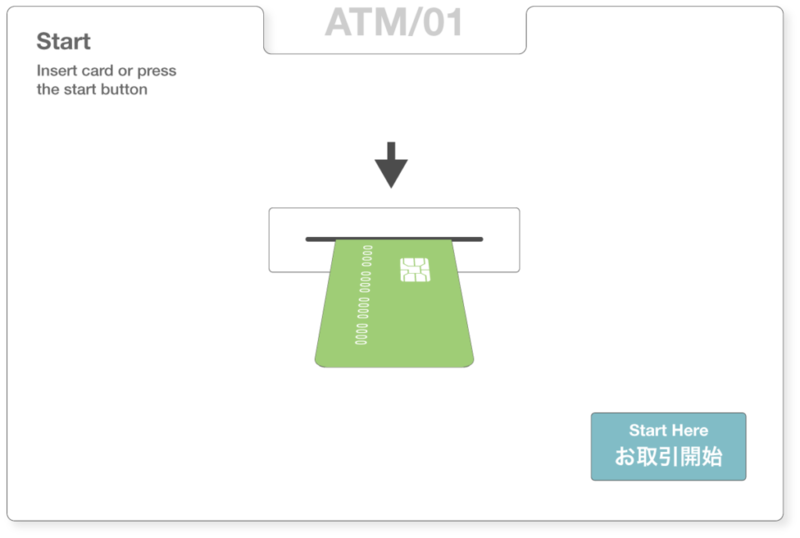 It works much like GoRemit; you’ll transfer money from your Japanese bank account online or via an ATM to the Transferwise bank account in Japan. They’ll then forward that money to the overseas bank account. The recipient doesn’t need to be a user of Transferwise either. Transfers typically take 1-2 days and you’ll get an email from them when the money arrives. Unlike many other countries, the rates at the airport aren’t all that different from what you’ll find at typical currency exchange shops in the city center, though you will make a little bit of a saving if you can exchange money in town. Although you may find a currency exchange service at some of the larger hotels in major cities like Tokyo and Osaka, hotel currency exchange counters aren’t as common in Japan as elsewhere. Additionally, they generally do not offer as favorable a rate as banks or high street currency exchanges will. Probably the most expedient and efficient way to change money, currency exchange shops, such as Travelex, can be found in or near most major hub train stations, as well as dotted around the major shopping districts in the larger cities. Also, since they deal with tourists all day every day, they will almost certainly have at least one staff member who can communicate in English. If you have the patience to navigate the language barrier and the bureaucracy, banks tend to offer very good rates and low charges for exchange. However, you will need to set aside up to an hour to complete the process depending on how busy the bank is. 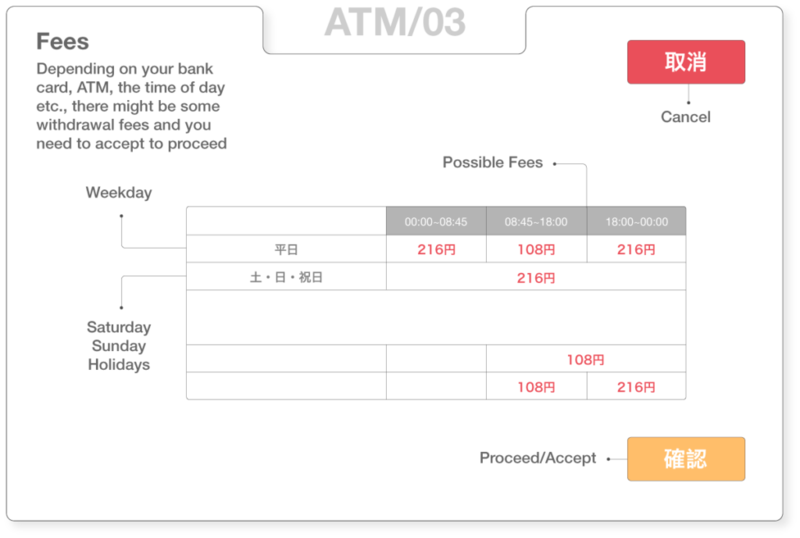 The Shinsei Bank GoRemit service is an easy alternative to the traditional banking service. 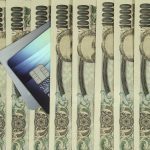 If you work in Japan trying to send money back to your home country can be a challenging experience. 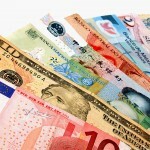 We take a look at the 7 Bank International Money Transfer service.